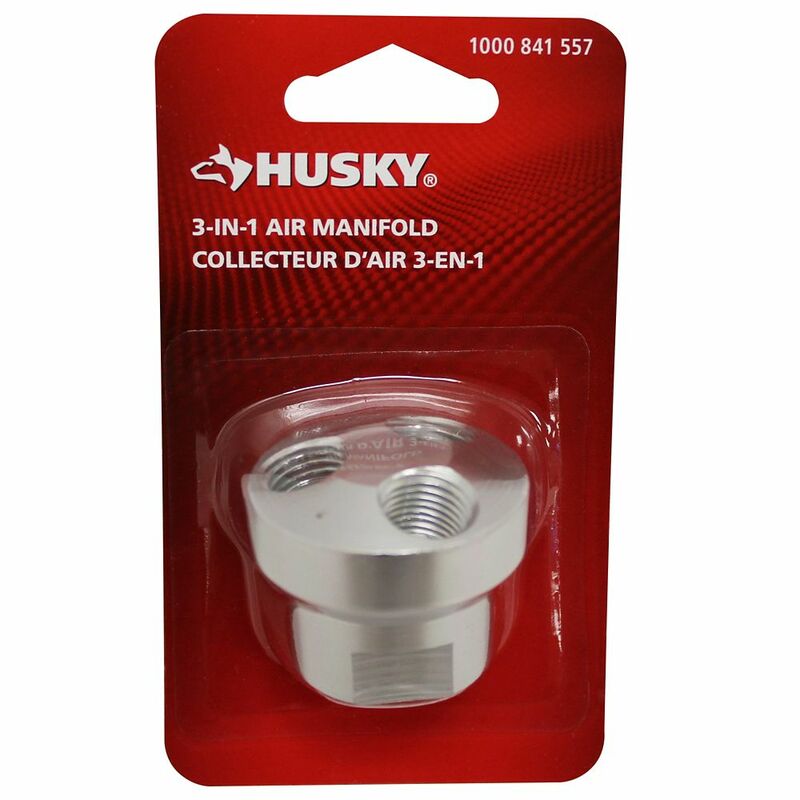 The Husky 1/4 inch NPTF 3-Way Manifold is used to split an air hose into 3 separate hoses or couplers. The manifold features one 3/8 inch NPT female input and three 1/4 inch NPT female outputs. Splitting the airline allows for more tools to be used at the same time, reducing time needed. Use with in-line regulators (not included) to achieve different PSI settings amongst hoses. The Husky 1/4 inch x 3/8 inch Universal Coupler features heat-treated lock balls and brass construction for a long service life. The tubular valve design permits a high airflow for excellent tool performance. The coupler has a 3/8 inch barb fitting and a 1/4 inch snap-in fitting for simple connections. Will fit with the three most popular plug designs, I/M, TF/Automotive and Aro. The Husky 1/4 inch Universal Male Coupler connects fits the three most popular style plugs, I/M, TF/Automotive and Aro. Tubular valve body offers high flow rates to provide excellent performance. Heat-treated locking balls and brass construction for a long service life. Eliminate coupler confusion with this single coupler. This Husky 125-cc Spray Gun Paint Cup is built to industrial standards for professional use. The paint cup features a durable polymer hosing with a steel threaded insert that helps prevent breaking while greatly reducing the weight. The cup is conveniently designed to fit all standard gravity feed spray guns. Three-Way Manifold The Husky 1/4 inch NPTF 3-Way Manifold is used to split an air hose into 3 separate hoses or couplers. The manifold features one 3/8 inch NPT female input and three 1/4 inch NPT female outputs. Splitting the airline allows for more tools to be used at the same time, reducing time needed. Use with in-line regulators (not included) to achieve different PSI settings amongst hoses.